Diary of an Aspiring Loser: Darnit, I Want Some Chocolate! Almost bad enough to drive to the store and buy some. I think I'll make some hot chocolate after I write this, hopefully that will fix my cravings. So things are going well. I went to the gym on Sunday, Monday and Tuesday so far this week. [So much for waiting until I finished this post, I just made my hot chocolate] On Sunday I did c25k Week 5/Day 1 and was hoping for an easy run. It was fine, but not the "easy" I was hoping for. Afterward I did my strength training routine. On Monday I rode the bike, level 5, for 25 minutes, more strength training. On Tuesday I did c25k again, Week 5/Day 2 and unfortunately it still wasn't "easy". Bummer. Not feeling so optimistic about my 20 minute run tomorrow (W5/D3) but hoping it will be, at minimum, better than last time. Today (Wednesday) was a day off from the gym. Food wise things have been going ok. I went out to lunch on Tuesday and instead of my normal grilled salmon sandwich with soup I got a Mediterranean salad with grilled salmon. I got the dressing on the side and used just a little of it. I don't have the calorie count but I think the salad was a better choice than the soup and sandwich and I felt better about the whole thing and that's probably more important in any case. I thought I had two social events this week but they are next week so I can relax a little. I had a whole scheme though for the food I would eat, etc. Next week I can put that into motion. We are having a party for Myra this weekend - can you believe my little sweetheart is already turning 1 year old?? 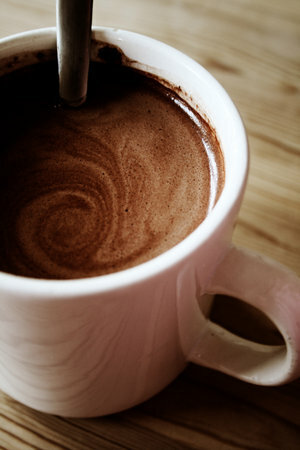 [Just finished the hot chocolate and it hit the spot] Time flies by so fast it's almost scary. I am looking forward to a party for my little love and to some fun times with our friends. Hopefully I'll be too busy to eat too much. This is a holiday weekend so I am taking an extra day off to really add to the fun. I bought one of those discount daily deal massages and I'm thinking about getting it on Tuesday. Should be a nice day. I'm planning to hit the gym tomorrow (Thursday), and either Friday or Saturday depending on how things go. Friday is good so I can take Saturday off and start the week with three days in a row of gym time, which I like. I don't want to go to the gym more than 3 days in a row if I can help it. If I go Saturday then I can work out Sunday, Monday, and would have to skip Tuesday. No, don't like that, I definitely want to go on Tuesday since I'll be off work and can spend as long as I want. Thursday and Friday it is. Oh! That reminds me. During my first training session with Ken he had recommended situps on a decline bench. I couldn't do even one at that time. I decided to try them again the other day and I could do eight! I have since done a bit of research and going all the way down might put strain on my back so if I can't do them without going all the way down I will skip them. Man, finding ab workouts that are not a strain on your back is not easy. Since weak abs mean your back will have to fill in to get the job done I will hopefully be able to return to some of these when my abs are stronger. My virtual coach suggested crunches on the stability ball, maybe it's time to give those a try. That's it for me. I just got some good news, nothing huge but something I'm excited about - more on that another day. Night all! Yay on the situps! I'm loving the ab workouts using a big ball...well, when I do it I love it. Hope run #3 is a LOT easier...just think of all those double amputees and you'll get through it. Have a happy baby birthday!